In the schools, children learn how important proper waste management is. They paint recycled bottles and fill them with compost for using them in the school’s vertical garden. The waste problem in Indonesia. This scene is from Java Island: Massive garbage dumps are polluting drinking water, soil and air. …and bring it to a recycling yard, where it is stored. Community members sort and recycle the garbage. The organic fraction is composted, other fractions are sold for further processing. Shredders prepare the organic waste for aerobic composting on bamboo racks. Bamboo racks and correct processing make sure that no methane will be emitted during composting. The generated compost is used as a fertilizer for locally grown vegetables. Here, the compost is used for the fertilization of cucumber plants. Through a street campaign, passers-by are sensitized for the value of compost. Vertical gardening is a good option to make use of the compost in private gardens. Only little space is needed, and many crops cope well with this kind of environment – especially when using compost as high-quality fertilizer. Experts check the quality of the compost. To make sure that the outcome is as good as expected and that no methane is emitted during the process, all staff members of the material recovery facilities are trained regularly and intensively. In the schools, children learn how important proper waste management is. ‘Uncle Dino‘ explains how to separate waste properly. 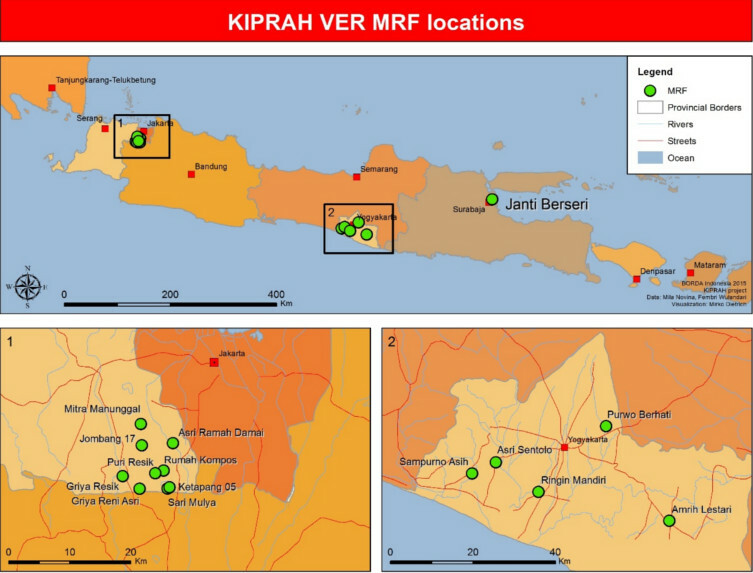 The locations of the 15 "Municipal Recycling Facilities" (MRFs) on Java Island. With more than 240 million people, Indonesia is one of the most densely populated countries on earth. Particularly urban areas have to cope with huge amounts of solid waste, which confront municipal infrastructures with major challenges and heavily burden the local environment. Existing landfills are often poorly managed and unable to absorb the increasing amounts of solid waste. Particularly in peri-urban areas, this leads to wild dumping of garbage even within human settlements. Solid waste is not only a major risk for the local environment and people’s health; it also causes considerable amounts of greenhouse gas emissions, particularly methane. Together with the German development association BORDA, atmosfair supports poor neighbourhoods in large cities on the Indonesian island Java to resolve the waste problem by themselves. So-called community-based organizations are trained to run small and decentralized recycling facilities (MRFs = Material Recovery Facilities). Waste is collected from households and brought to MRFs where it is separated by local employees. Recyclables like plastics and glass are sold and help financing the operation of MRFs, while the organic fraction is composted and provided as fertilizer. So-called bamboo aerators guarantee that sufficient quantities of oxygen are available during composting which avoids methane emissions. The small remainders are brought to existing landfills. By supporting the operation of MRFs, the project helps to create jobs, improves the capacity for self-organization and contributes to improve the situation of local health and environment. Organic waste, which has not been treated or recycled properly before implementation of the programme, produces methane – a seriously polluting greenhouse gas – during the process of rotting. Now, the organic waste is specifically composted in the respective recycling facilities. Deploying certain bamboo aerators this special composting method avoids the production of methane through the supply of oxygen. Methane bears a 25 times higher global warming potential than CO2. This means, that within the first 100 years after its emission the contribution of methane to the greenhouse effect is 25 times larger than the respective CO2-value. As a consequence, the abatement of methane is a crucial step for fighting global warming. atmosfair is part of the KIPRAH-programme since the end of 2009; since 2013 a standardized monitoring process is run in order to assess the amount of methane reduction in compliance with Gold Standard criterias. The decentralized organisation structure of the recycling facilities serves as a framework model to solve the increased waste production in the bigger urban areas, since it reduces work load of the giant, centralized dump sites and regains valuable waste materials. Of course, the structure and operation of the recycling facilities creates jobs too. There are at least two regular employees in each of the recycling yards. In addition, professionals are trained by KIPRAH in decentralized waste management. Collecting, recycling and composting avoids risks to health for humans and the environment which could occur if waste was not managed properly otherwise. The newly build infrastructure raises awareness for environmental issues. Within the KIPRAH-programme BORDA closely collaborates with the local governments who – due to good experiences with the recycling faciliites – in turn have voted for changes in communal waste legislation several times. Waste Turns Into Life: Compost Used as Fertilizer for Gardening and Public Green Space. Every single recycling facility produces an average of 800kg compost per month. Usually, this is sold to neighbours or farmers for gardening purposes or to the municipal government to manure public green spaces. This generates additional income of approximately 50€ per month. The qualitiy of the compost is verfified and certified by the ministry for agriculture. For several years “Uncle Dino” explains to the kids in Java in a playful way how inappropriate handling of household waste becomes a threat to health and the environment. In theatre dramas and songs the children learn how to collect and separate the trash. In handy craft lessons the pupils can practice reusing plastics. Hereby, many classes have created so called “vertical gardens” made of PET-bottles. In order to avoid the waste problems of tomorrow “Uncle Dino goes to school” is therefore an important component of the KIPRAH-programme. Support this climate protection project and many others with your donation.